The cloud point temperature is a characteristic value in the quality control of synthetic resins or printing inks. Deviations in cloud point can lead to sedimentation the varnish, differences in drying speed, loss of gloss and tack stability. The cloud point is the temperature at which a resin begins to precipitate in the liquid phase.The automatic cloud point test method introduced here, has been approved by a great number of resin manufacturers worldwide as a standard method for production setting and quality control of printing ink resins. Process chemists are able to maintain a check on the development of the process in the reactor and the quality of the resin by regular cloudpoint measurements during production. Generally, paste inks have a high resin concentration, so that cloudpoint tests are a meaningful method to check the consistency of incoming supplies of resins. Deviations in cloudpoint can lead to lower drying speed, loss of gloss and tack stability of printing inks. In production and storage of many chemical products turbidity is involved. The automatic cloudpoint tester is an important tool for process optimization and finished product performance tests. The standard test procedure to test the cloudpoint of natural or synthetic resins for the production of printing inks is as follows: Two grams (0.07 oz) of resin and 18 grams (0.63 oz) of test oil are weighted into a glass test tube in which a magnetic stirrer rod has been inserted. 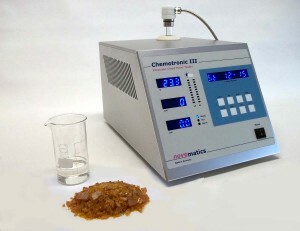 Under controlled heating and stirring conditions the sample is heated up to 230 °C (450 °F) and remains at this temperature level for 2 minutes during which the resin is completely dissolved in the test oil. This clear and homogeneous solution is then cooled down until the cloudpoint temperature is reached. At the end of the test the measured value is printed on paper with a test report by an integrated data printer. The turbidity detection system of the CHEMOTRONIC III based on light transmission. In principle turbidity is detected by the absorption due to suspended particles in the liquid. Errors due to colour changes are eliminated by the use of a narrow band infrared light source. The user can adjust which turbidity is recognised as cloudpoint by executing a calibration procedure and choosing one of the 10 turbidity levels. The CHEMOTRONIC III is recommended by the European working group for standardisation of ink test methods EUROCOMMIT as a preferred method for cloudpoint measurements in research and industry. Extensive round-robin tests have proven the reliability of this test method.